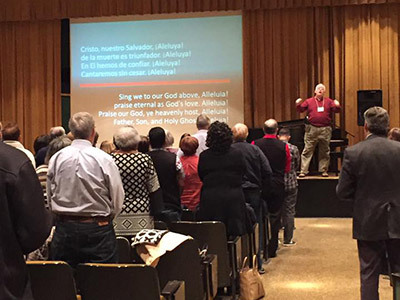 The 180 people that gathered for the WMI conference were inspired and challenged by keynote speakers and workshop leaders during the biennial event, held April 13-14, 2018. Mark Adams and Miriam Maldonado challenged participants in their keynote speeches to see beyond the border. They encouraged us to look at the border not just as a place that separates us but as a place of possibility where strangers and people of different nationalities can come together to celebrate their diversity and show acts of kindness and love by supporting each other, providing shelter, and protecting each other’s human dignity. In his keynote speech, Brian Cress challenged participants to engage not only in charity work but also to seek justice for the vulnerable in our world by being the voice that fights for their rights and dignity. Throughout the conference, we were all reminded that we worship a God in Jesus Christ who crossed many boundaries and who stood with the poor and needy and fought for the rights and dignity of all God’s children no matter where they came from. We were also blessed by the workshops that helped participants engage in different topics and by the various organizations through their mission displays that helped participants connect with one another and also to learn how they could seek justice for those who are in their neighborhoods. Thank you to all those who attended and also those who sponsored and supported the conference in many ways. We hope and pray that this conference has not only opened the eyes of many to what God is doing in our world but also will continue to challenge and call us to work for justice and to stand for what is right for all God’s children.